A RED ALERT has been issued for tonight in Leinster, Munster and Connacht, as Met Eireann forecasts thunderstorms. A major emergency was announced in Kilkenny earlier this evening, but has since been stood down. The major emergency coordination group will remain in place to monitor developments until 10pm. All inter urban routes to and from Kilkenny city are now open, but caution is still advised. Many local roads remain blocked and will be dealt with as soon as possible, say gardaí. A large number of trees adjacent to roads are still in a dangerous condition and there is a large amount of debris on roads, which may pose a hazard to motorists. Fallen trees may be dangerous because of entangled live electrical cables. The area surrounding Nolan Park remains closed to both traffic and pedestrians. Earlier, a stationary plane was tipped onto its side at Shannon Airport as strong winds continue to batter the south west of the country. 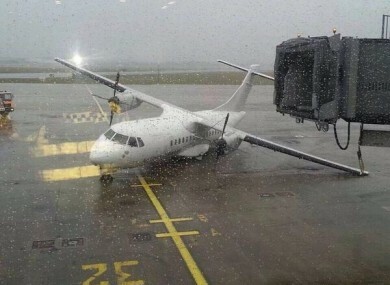 The airport confirmed that it is closed after winds hit 86 knots, around 160 km/ph. Some 215,000 people are without power as strong winds affect power supplies. The ESB says that that number will grow, as winds pick up. “As winds have not yet reached their peak, this number is expected to grow,” a spokesperson said. “A fault on our 110KV network supplying west Cork and Kerry has resulted in loss of supply to over 50,000 customers. The standby high voltage network is now being used to restore supply to the affected 38kV stations, each serving between 3,000 and 5,000 customers, as quickly as possible. Students in UCC have been warned not to leave the building they are in. The college has sent an emergency text to students cancelling the lecture timetable until further notice, saying that there was a danger of falling branches, slates and debris. IT Tralee has also cancelled lectures and asked students to stay inside until at least 3pm. UL have also asked students to stay in the buildings they are in. In Galway, Bus Éireann have cancelled city services until 4.30pm. In Wexford, reports say students at a New Ross school have been told not to leave the building, after the roof of a swimming pool in the area was blown off. Cork and Kerry are still under a Met Eireann red alert warning, with Dublin, Kildare, Louth, Meath and Wicklow having been upgraded to orange status. Clare, Galway, Limerick, Mayo, Waterford and Wexford are also under orange alerts. The rest of the country is under a yellow status, with high winds and rain expected. Motorists are being urged to take care on roads after a truck went onto its side on the M8 near Fermoy. Limerick, which is still reeling from flooding just 10 days ago, is set for another round of floods, as the River Shannon burst its banks this afternoon. In Athleague in Roscommon, a “mini-tornado” was reported. Residents said that the strong winds knocked over sheds and carried debris into roadways. A spokesperson for Met Eireann told local radio station Shannonside FM that they were aware of the twister, but had not observed it. Joanna Donnelly told the station that it was “not unusual” to see these events during this kind of weather. Email “Uh oh: Met Eireann issues red alert for Leinster, Connacht and Munster”. Feedback on “Uh oh: Met Eireann issues red alert for Leinster, Connacht and Munster”.